I came across an incredible, and rather sad, quote from Charles Darwin today. Up to the age of thirty, or beyond it, poetry of many kinds…gave me great pleasure, and even as a schoolboy I took intense delight in Shakespeare, especially in the historical plays. I have also said that formerly pictures gave me considerable, and music very great, delight. But now for many years I cannot endure to read a line of poetry: I have tried lately to read Shakespeare, and found it so intolerably dull that it nauseated me. I have also lost almost any taste for pictures or music … My mind seems to have become a kind of machine for grinding general laws out of large collections of fact, but why this alone should have caused the atrophy of that part of the brain alone, on which the higher tastes depend, I cannot conceive… The loss of these tastes is a loss of happiness, and may possibly be injurious to the intellect, and more probably to the moral character, by enfeebling the emotional part of our nature. If Darwin cruelly depreciates his own achievement, he at least celebrates an appreciation of other, more artistic pleasures – ‘the higher tastes’, as he calls them. He connects a taste for music, literature and art to the cultivation of a strong intellect, moral character and emotional intelligence. That’s pretty profound. It’s a reminder that, as strategists, the ’emotional part of our nature’ is as important as our willingness to immerse ourselves in data. We should avoid merely grinding general laws. If Darwin can recognise the limitations of that approach, who are we to argue? 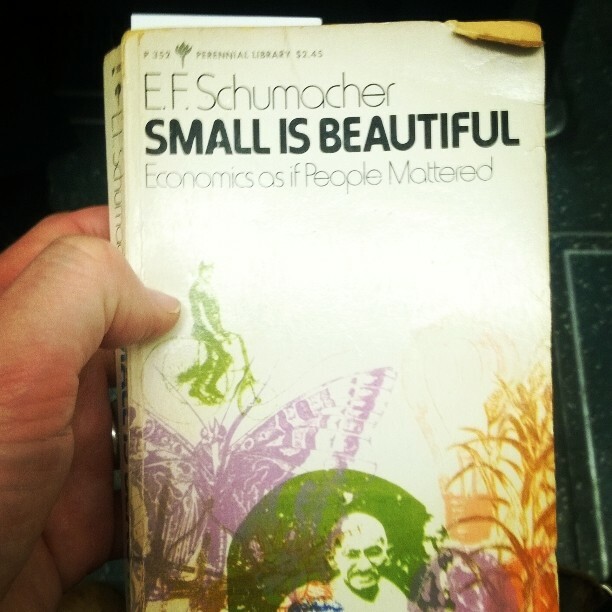 The quote comes from a book I’m reading called Small Is Beautiful by E.F. Schumacher, first published in the 1970s. The book’s subtitle is, Economics As If People Mattered. I recommend it. The quote arrives when Schumacher is discussing the role of education. He asserts that it’s in people’s nature to think in opposites. He talks about the concept of divergent and convergent thinking and makes the case that life consists of problems which cannot be solved by logical reasoning. Life is kept going by divergent problems which have to be ‘lived’ and are only solved in death. Convergent problems on the other hand are man’s most useful invention; they do not, as such, exist in reality, but are created by a process of abstraction. When they have been solved, the solution can be written down and passed on to others, who can apply it without needing to reporoduce the mental effort necessary to find it. If this were the case with human relations – in family, life, economics, politics, education, and so forth – well, I am at a loss how to finish the sentence. There would be no more human relations but only mechanical reaction; life would be a living death. Divergent problems force man to strain himself to a level above himself; they demand, and thus provoke the supply of, forces from a higher level, thus bringing love, beauty, goodness, and truth into our lives. It is only with the help of these higher forces that the opposites can be reconciled in the living situation. The physical sciences and mathematics are concerned exclusively with convergent problems. That is why they can progress cumulatively, and each new generation can begin just where their forbears left off. The price, however, is a heavy one. Dealing exclusively with convergent problems does not lead into life but away from it. So, life attains meaning with problems that can only be solved at a higher, emotional level. Cultivating tastes for stimuli that speak to the higher, emotional aspects of ourselves makes us better at understanding and living life. These higher forces and tastes lead us into life. They connect us to more experiences and the perspectives of more people. They make us more sympathetic to the lives of others. His answer underlines the point made by Darwin and Schumacher. By encouraging exposure to narrative art – the novel, film, drama – the sympathies can be educated, refined, enlarged. To gain access to another’s perspective on life demands a certain kind of informed and interpretative sympathy. Most people can learn something about the needs and interests of others from their own experiences and from their own observation of people around them; but if this were the only resource, the scope of an individual’s sympathies would be rather limited. Exposure to the narrative arts overcomes that limitation: they greatly widen one’s perceptions of human experience, and enable one – vicariously, or as a fly-on-the-wall witness – to see into lives, conditions and experiences which one might never encounter in practice. This enlarging of the sympathies is a basis for richer moral experience and a more refined capacity for moral response. Only if one has a rich array of possible narratives and goals to choose from can those choices and actions be truly informed and maximally free. Once again, exposure to stories – which in part represent possible lives – is a vital ingredient in the ethical construction of one’s personal future history. I am not a philosopher. Nor am I a scientist or an economist. I’m not quite sure exactly what I am, to be honest. But I am paid to understand and be interested in other people. I’ve also long held a belief that fiction is a valuable tool in helping me be better at my job. Fiction provides an insight into the lives of others. It offers different perspectives, mapping out reference points for the behaviour of real people. It explores motivations, relationships, adversity and emotions. You don’t find those in big data. When I hear people in agencies say, I don’t really read books, I despair a little. We need more fiction in agencies. Agency book clubs shouldn’t just include the latest industry set text. They should include novels. You can learn a lot about how social mores govern individual behaviour from Middlemarch. Box sets don’t only represent changing TV consumption. They represent a chance to discuss the difference between what people say and how they behave. I think planners shouldn’t only meet at conferences. I think they should go to the theatre together. Here’s to the lives of others, and the power of fiction to bring them to life.